Situational awareness: Heading to Advertising Week NYC? I'll be interviewing some of the best in the business on Tuesday and Thursday. Email me to connect or stop by. After years of preaching self-regulation, the world's biggest advertising companies are suddenly getting behind the idea of national regulation on privacy. Why it matters: The ad industry realizes it can't avoid regulation forever, especially in light of increased data breaches and scandals over the past year, so its best bet is to support federal rules now rather than face dozens of different state regulations down the line. The Interactive Advertising Bureau (IAB) said last week it supports "sensible" national privacy legislation to avoid state-by-state solutions. Four of the biggest advertising trade bodies (ANA, IAB, ARF and CIMM) introduced a "Data Transparency Label" Monday at Advertising Week NYC, which is like a nutrition label for audience data that discloses the sources of data and segmentation. Ad giants, including Google, Apple and AT&T, told lawmakers at a hearing last week that they generally support federal policy rules while pushing back on state-led efforts. 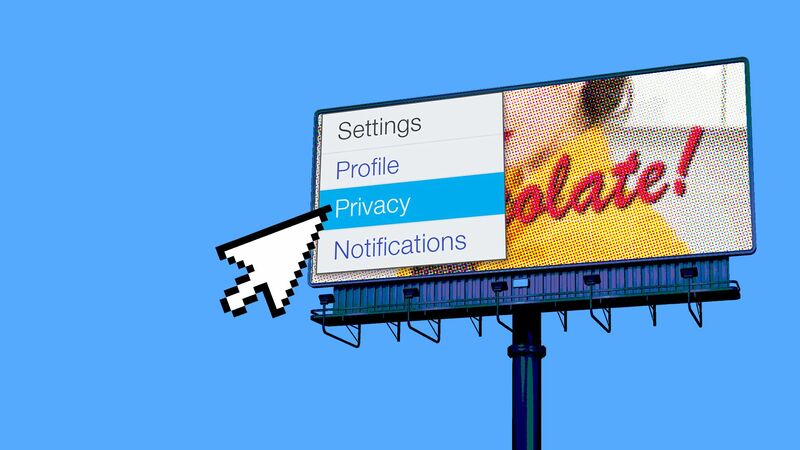 The other side: These companies are wary of some of the biggest policy proposals backed by privacy advocates, like mandatory opt-in. Between the lines: The ad business continues to become more reliant on data-based targeting, resulting in calls for a national privacy framework in the U.S. to mimic the one implemented this year in Europe — the General Data Protection Rule (GDPR). Facebook's latest data breach — impacting 50 million users — could cost the company upwards of $1.63 billion, per WSJ, under the highest possible GDPR penalty in Europe. The FTC hasn't concluded its investigation into Facebook's Cambridge Analytica scandal in March, nor has it levied any fines. Until data is misused, Facebook's breach will be forgotten, TechCrunch's Josh Constine predicts. Be smart: Even though ad giants believe that supporting a national framework will stave off state approaches, federal regulation is still unlikely. "We're skeptical of passage given the complexity of issue and potential House-Senate split in 2019-20. We see only a 35% chance of Congress passing privacy legislation in the next two years." Nearly all of the biggest U.S. advertising companies are trying to rebrand their convoluted ad tech services under simpler names. AT&T named its new advertising company "Xandr" last week. Verizon's Oath unified its ad tech under new brand, "Oath Ad Platforms" in September. Amazon streamlined all of its ad products under a new "Amazon Advertising" umbrella in September. Google rebranded its entire ads suite in June. Why it matters: It's a marketing move by marketers. Industry consolidation and rapid change in the digital advertising world has led to such confusing ad tech stacks — or suite of services — within mega companies that marketers struggle to keep up. A simplified ad brand helps bring a better-packaged product to market. The big picture: Unified ad offerings will become more important as these groups expand their ad tech capabilities even wider into digital TV ads. AT&T announced last week it's integrating Altice USA’s advanced advertising business called a4 to help expand its addressable digital advertising capabilities. Amazon has discussed building its own advertising technology for OTT TV, per Business Insider's Mike Shields. Facebook is adopting some of the TV industry's sales techniques for Watch, per Business Insider's Lauren Johnson. Some of the industry's most well-known and influential marketers today are female executives like GE CMO Linda Boff, Facebook VP of Global Marketing Solutions Carolyn Everson, JPMorgan Chase CMO Kristin Lemkau and Endeavor CMO Bozoma Saint John (formerly at Uber). Why it matters: The Madmen stereotype of male-dominated advertising and marketing bosses has long been challenged by women who have risen to become CMOs with personal brands that transcend their employers. Between the lines: CMOs today are often at the helm of complex decision-making around new-age corporate problems, such as managing corporate tone during a social media crisis or deciding how much a company should leverage new digital technologies with unproven returns on investment for customer acquisitions. Many of the aforementioned women have embraced these challenges, and are becoming thought leaders because of it. For example, Facebook's Carolyn Everson was the first executive to respond on stage to Facebook's security breach crisis and WhatsApp founder spat Monday. She told Madison Ave. that she wasn't worried that that the breach wouldn't impact ad spend, per Cheddar's Alex Heath. Axios noted last week that GE's Linda Boff is the person pushing GE, a 126-year-old company, to take risks in the way it markets itself. The big picture: Marketing jobs skew more heavily female than many occupations, but the role of chief executive still skews male. The Association of National Advertisers' "CMO scorecard" this year found that, of the 747 CMOs within its corporate membership, more CMOs skew male over female — 55% to 45%, respectively. According to the Bureau of Labor Statistics' 2017 Current Population Survey, 45% of "marketing and sales managers" are women, and 61% of "market research analysts and marketing specialists" are women, which is high compared to other occupations in STEM, finance and politics. A new Pew Research Center study out Sunday found that the percentage of Americans that do various media activities, like use social media or the internet, has plateaued or declined. Those forecasts mimic those of eMarketer (above) which has found a similar pattern, with the exception of digital video. Why it matters: The reason the percentage growth of usage of technologies like mobile, internet and social media is declining is because those technologies have reached a saturation point in the U.S. Between the lines: As Axios has noted previously, social media use on open networks is also declining as more people transition their social communication online to encrypted messaging networks. What's next: Virtual reality, augmented reality and 5G. While adoption of all three is growing, AR has the most commercial use and is growing at the fastest rate, due in large part to social media leveraging AR technology to increase user engagement. There seems to be a new 5G announcement every week, with the latest being Verizon’s first 5G commercial launch on Monday in parts of Houston, Indianapolis, LA and Sacramento. But roll-outs are limited in scope, Axios' Kim Hart writes. Why it matters: Despite the hype about the first 5G-capable devices hitting the market next year, it will be years before average consumers experience the new networks. Even after 5G is more widely available, many devices will still rely on 4G for roaming outside of 5G coverage areas. By 2023, research firm Strategy Analytics projects only 6.5% of global wireless subscriptions will be 5G, while 70% will be 4G. The other side: Some experts predict early uses of 5G will consist of fixed wireless and industrial “internet of things” applications, rather than consumer-facing subscriptions. The key to driving consumer adoption is developing compelling uses for the networks — such as new ways to deliver content or interactive entertainment — to give consumers a reason to upgrade from 4G technologies. The bottom line: We’ll be in a 4G world for the foreseeable future. Last year Facebook and Twitter touted the millions of views that the Comey hearing racked up on their live platforms. Facebook said videos related to the testimony garnered 89 million views. Twitter said 2.7 million people watched it through its co-branded livestream with Bloomberg, its exclusive news partner. Eighteen months later, neither company has reported live viewing numbers for the Kavanaugh hearings. Facebook says it's not releasing a number this time. Twitter says it's because the technology has become ubiquitous. "Every news outlet is streaming live during every major event so we’re not releasing numbers anymore," says a Twitter spokesperson. The bottom line: There's still no good way to measure how many people actually watched the hearing (or any major live event for that matter) without some sort of cross-platform video standard. But we do know that viewers expect to see live feeds of any major national events on their phones. It's the new normal. Longtime Facebook executive Adam Mosseri has been tapped to lead Instagram in the wake of the abrupt departures of the photo apps' two original founders last week. Mosseri has been with the Facebook network for roughly ten years, most recently serving as head of product at Instagram. Why it matters: Reports of a culture clash between Instagram and WhatsApp founders with Facebook management suggest that it can be difficult to integrate new companies into Facebook's larger vision and business plan without friction. Our thought bubble: Mosseri played a very public role at Facebook in the aftermath of the 2016 election, explaining the way Facebook's News Feed worked and how the company was tackling misinformation. He may be new to the chief executive role, but he has plenty of experience managing both corporate and product needs. What's next? Bloombergs's Sarah Frier book announced Monday she's writing a book about Instagram. Meanwhile ... The longtime head of ads and search at Google, Sridhar Ramaswamy, is leaving for the VC world. His departure comes after Facebook and Snap's top business executives (Dan Rose and Imran Khan) both announced they are leaving this year. Why it matters via Dan Primack: Ramaswamy was overseeing the part of Google that generates most of its revenue. Longtime Telemundo anchor José Díaz-Balart is one of the only people in television to anchor two different nightly newscasts for two different broadcast networks in two different cities, in two languages ... every week. He anchors Telemundo's nightly newscast Monday through Friday in Miami in Spanish and NBC's Saturday evening newscast in New York in English. Why it matters: Díaz-Balart has a unique lens into how two populations living alongside one another have totally opposite relationships with the media. The relationship between Spanish-language anchors and their audiences is much more intimate than the relationship between English-language anchors and their audiences, he notes. "The Latino audience does indeed have a different relationship with Spanish-language media ... When these issues are happening and they live and they hurt and they cut so close (like immigration, border security, etc.) that is is a responsibility of ours (to give them answers) and it is a relationship with our viewers that is closer than that of my audience in English that I adore." Social media avatars are reaching new dimensions—three dimensions, to be exact, Axios' Kia Kokalitcheva writes. Driving the news: 3-D avatars of all sorts are appearing, from Apple and Snapchat’s animated cartoons, to apps like Gabsee and the stealthy Morphin app, which lets users recreate famous GIFs with a computer-generated imagery version of themselves. And of course, virtual reality companies, including giants like Facebook, have long been refining their 3-D avatars to let users socialize online. Why it matters: Advanced technologies, like computer-generated imagery (CGI), are making it possible for people to create more lifelike online identities. At the same time, CGI tech is also shaking up popular culture by giving rise to fictional models like Shudu and Lil’ Miquela, who are even nabbing real fashion gigs while raising questions about ethics and cultural appropriation.